How can I in Visio change the color to a previously selected color just by selecting a shape? setting the color of the selected shape. The code for this project can be found at https://github.com/GVerelst/ActOnShapeSelection. I decided to use Visual Studio 2017 to create a Visio Add-In. To do this we need to install the “Office/SharePoint development” workload. 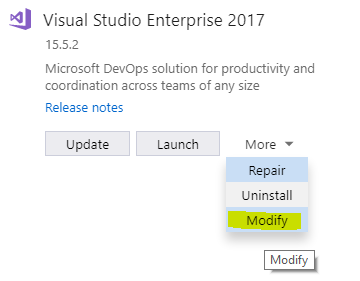 Since Visual Studio 2017; the installer allows for modular installation, so we just need to add this to our installation. After a little while this takes us to the workloads selection screen. Select Office/SharePoint development and then click “Modify”. 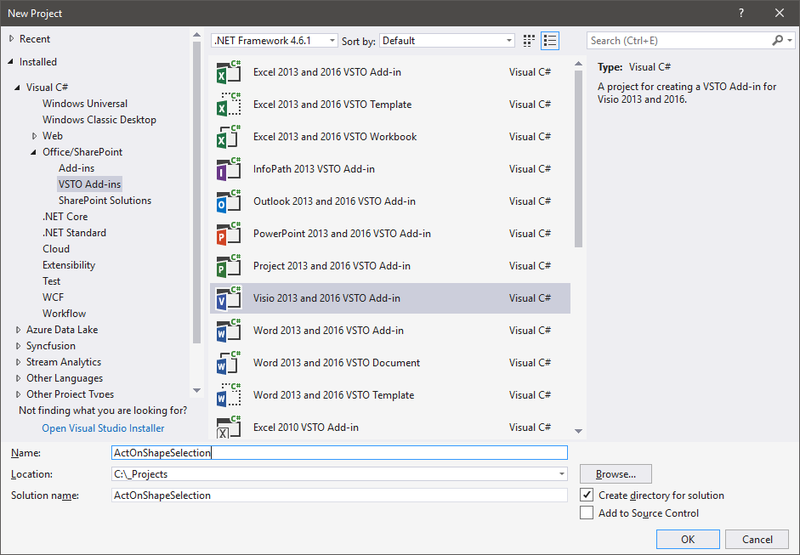 When you launch Visual Studio again you’ll find a new bunch of project templates. As you can see there are new project templates for “Office/SharePoint”. I choose the Visio Add-in project and gave it an appropriate name “ActOnShapeSelection”. Remark: by default the namespace System.Windows.Forms is not included in the using list, so we will need to add it. An easy way to do this is by clicking on the red-underlined MessageBox and typing ctrl+; (control + semicolon that is). Now we can choose how to solve the “using problem”. Starting the application (F5) will now start Visio and our first message box is indeed shown. Closing Visio shows the second message box. No rocket science so far, but this proves that our add-in is loaded properly into Visio. Convincing Visio to do something when a shape is selected is just a bit harder. The SelectionChanged event must be wired in the startup event. Later we will do the same for the ShapeAdded event. Once you know this “trick” things become easy. As expected this is a dynamic object. Visio is accessed over COM. Luckily the debugger allows to expand the dynamic view members. Looking through the members of this object we find a property “Selection”. This looks promising! Looking a bit further, “Selection” is an implementation of the interface IVSelection. And this interface inherits from IEnumerable. We run the add-in again (F5) and add 2 shapes on the page. When we select the shapes, they get the text “selected”. So now we are capable of knowing which shapes are selected and doing something useful with them. Let’s add a new ribbon with actions to perform on our shapes. After all, that is the purpose of this exercise. This can easily be done by right-clicking on the project, New Item. 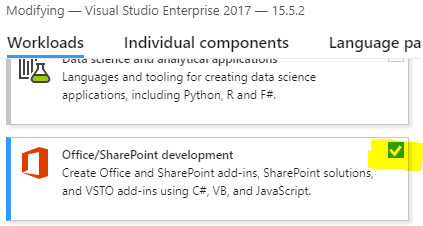 Then select Office/SharePoint > Ribbon (Visual Designer). Opening the ribbon, we can now use the visual designer. Make sure that the toolbox window is visible (View > Toolbox). Now we add 3 ToggleButtons on the design surface, named btnRed, btnGreen, and you guessed it: btnBlue. For each of the buttons we add a Click event by double-clicking on the button. 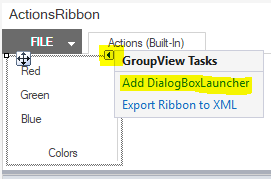 Using the GroupView Tasks we also add a DialogBoxLauncher. This will open a ColorDialog for selecting a custom color. Double-click the group to implement the “DialogLauncherClick” event, which will handle this. Remark: This code works fine if there is no possibility for a custom color. When selecting a custom color the values will become something else than 0 or 255 and not correspond to the UI anymore. I leave it as an exercise to the reader to make a better implementation. There is some Visio-fu to set the color. Consider this as a cookbook recipe. When you do this, you’ll get the desired result. Visio is not always straightforward, one could say. We also add a boolean indicating if we are adding a shape or not. Using Visual Studio it took us about 100 lines of code to implement the desired behavior. It would not be hard to add more actions to the ribbon. But in that case it will be wise to move the code to perform the action into the ActionRibbon class instead of using the values of this class in the AddIn class. The hardest part was to find how to obtain the newly created Ribbon from within the AddIn class. All the rest is just a straightforward implementation. This entry was posted in .Net, Codeproject, Development, Office Development and tagged Add-in, Visio. Bookmark the permalink.